Here is a collection of maximal and sub-maximal aerobic fitness tests. Which one to use? There is more information about Aerobic Fitness Testing. Yo-Yo endurance tests - a beep-type test with rest periods developed for intermittent sports. Vmax - simplified version of the VO2max test. University of Montreal Track Test - the original beep test. 1200m Shuttle Test - to and from a start line to 20, 40 and 60-m marks, 5 times without a break. Soccer FIT Interval Test - two consecutive runs decreasing from 30 seconds, then resting for 30 seconds. Andersen Test - 15 seconds run, 15 seconds rest. 10m Beep Test, designed for children with cerebral palsy (CP). 10m Incremental Shuttle Walk Test for people with COPD. Shuttle Swim Test - for water polo players. 1 km Swim time trial for triathletes. 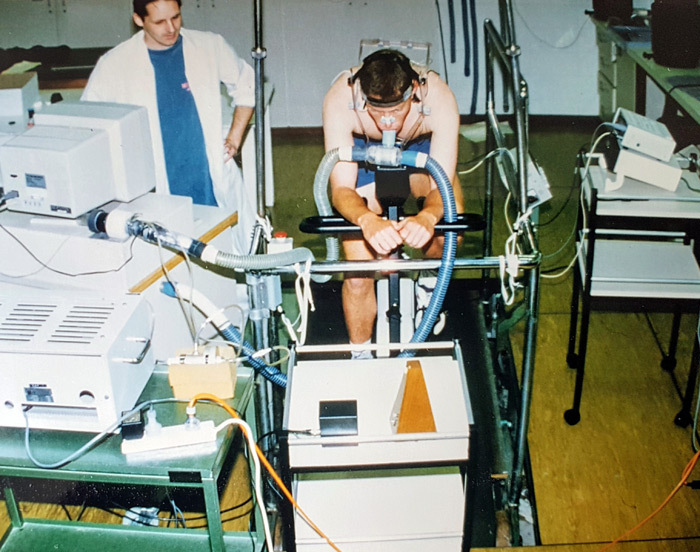 A Multistage Field Test (MFT) for wheelchair users. J.A.M. intermittent test a test based on the intensities of a game of Rugby Union. Loughborough Intermittent Shuttle Test for soccer players. FIFA Interval Test 2 for soccer referees. Modified Beep Test for Rugby League referees. Lucas 12 test, a modification of the original Cooper test to include running, rowing and cycling modes. Polar Fitness Test - based on heart rate variation. Non-Exercise Fitness Test - VO2max using regression equations. VO2max test scores from different sports. what are the highest ranking endurance sports?